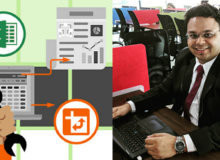 In this blog post, we will be focussing on 4 of them – SUM, SUMIF, SUMIFS, DSUM. Each of these functions has its own capability for Summing up numbers. Let’s go one by one. We will be using a sample data set of Umbrella sales (1000 rows of data), to understand each of these functions in detail. Thus the data range is, A1 : J1001. Sum function will get you a sum from multiple individual cells, a single range, or even multiple ranges in 1 shot. 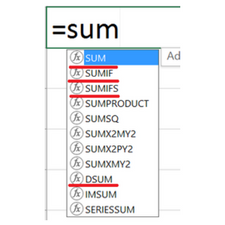 Sumif function gets you a sum based on 1 condition (only). Criteria – Blue (the actual condition). The criteria is not case sensitive. The “blue” can be written in upper case or small caps, doesn’t matter. Since the criteria is text, it needs the ” “. If the criteria was a number, it wouldn’t require the ” “. Date will require ” “. Range – The column where Blue, the criteria, resides. Thus Color (G) column in this case. Sum_Range – Sum of what? Quantity, Total? since we need the Sum of Quantities, we choose Qty (I) column. 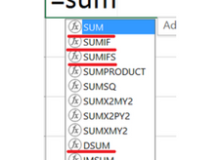 Sumifs (notice the ‘s’) gets you a sum based on multiple conditions. But it also works with a single condition as well! Observe carefully that in the case of SUMIFS, the Sum_Range comes first! Thus, no 2 conditions should fall in the same column. If they do, your formula will be a little different, explained below in the next example. The order can’t be messed up – Sum_Range first! As stated above too, SUMIFS is capable of handling a single condition too. 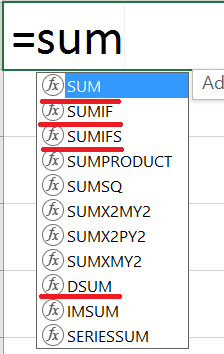 I thus never use SUMIF, i only use SUMIFS. Observe that in this case, both the conditions are falling into the same Color column. Thus, both conditions need to be ORed. Now, what if you needed to have a summation of quantities of Blue, Black, Yellow and Pink colors! What is there are 40 different colors of umbrellas that you are selling, and you want a total of 20 of those colors! Instead of writing =SUMIF + SUMIF + SUMIF + SUMIF + ….. 20 times, simply use DSUM !!! =DUM let’s you create your condition outside the formula, making it very dynamic in nature, and easy to create. 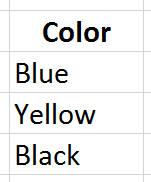 Write the column Header first (exactly same as in the data), in this case ‘Color’. Below that, write each of the colors, one below the other. When you write the criteria’s one below the other, it means OR-ing. Field – Select only the header of the column, of whose SUM you want, in this case the Quantity column, hence I1. Criteria – Select the grid that have you created outside. When you write the criteria’s next to each other, it means AND-ing, and below means OR-ing. 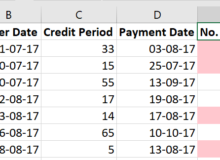 To calculate number of months between 2 dates requires =Year and =Month formulas. 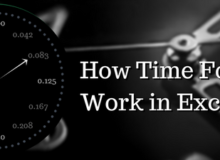 Before we get into it, let us first see how to calculate number of days between 2 dates. To find number of days between 2 dates as super easy! This will calculate no. of months between the 2. Both values are then added. 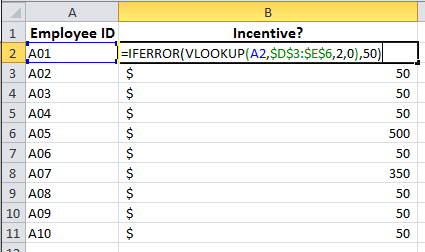 Index function has advantages over Vlookup. Use it in a simple scenario like to calculate distance between 2 cities, when the data is in a table format. We want to find the distance between any of the 2 cities using the =INDEX formula. Basically, whichever 2 cities you decide, you want the intersection value in the output. Example, if you want to find the distance between Dallas and Denver, the output will be the intersection which is 801 miles. Data Range = Select the Entire Range of the data grid. Row No. = Since the From location is Dallas, the Row No. will be 4. You have to start counting from cell A1, downwards (A1 is the 1st cell in the data range). Column No. = Since the To location is Denver, the Column No. will be 5. You have to again start counting from cell A1, to the right (E is the 5th column, thus 5). Thus the output will be the intersection value, that is, 801 miles. 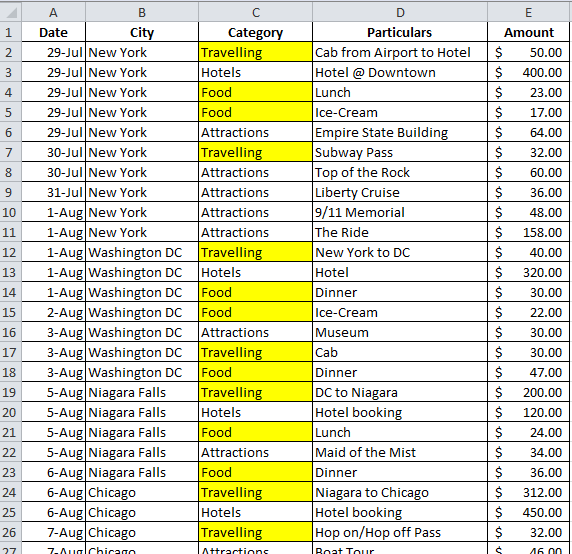 You have a list of expenses made during a holiday to the USA, and you want to highlight in yellow color – only the expenses made for Food and Travelling. 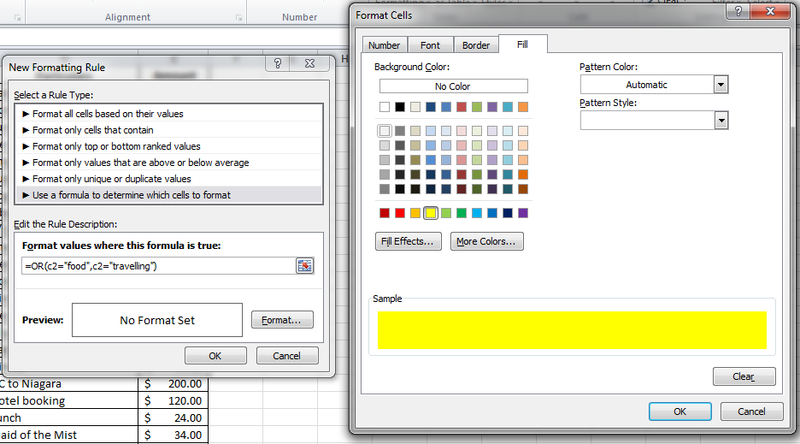 Conditional formatting with OR function can be used for this. You could avoid using OR function, but then you would have to create 1 rule for each – food and travelling. But if you had to include 5 things to be highlighted with the same color, you would have to create 5 different rules. Rather, create 1 single rule for all together. 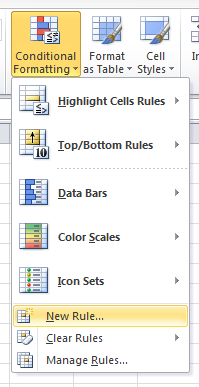 To understand conditional formatting basics, see this. OR function enables us to mention all the conditions in a way that if any 1 of the conditions is true, conditional formatting will be applied. 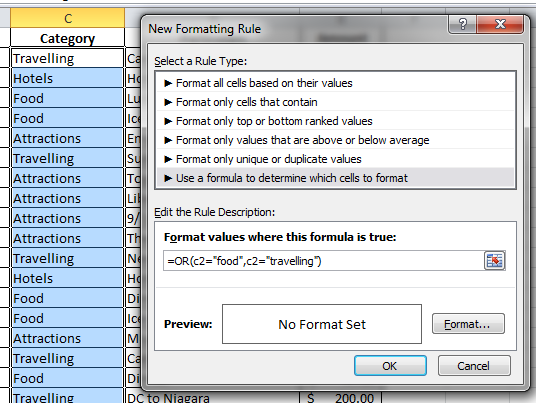 Thus, OR (food, travelling) means if either “food” OR “travelling” is present in the cell, the conditional formatting will be applied. 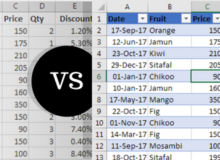 As you see that column C has the data of Category, we will that column while creating the OR formula within conditional formatting. 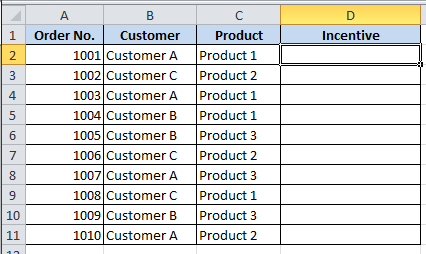 Select the C column, without the header (do not select the 1st row). Go to Home tab, Conditional formatting, New rule. 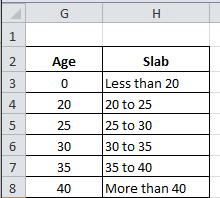 Select “Use a formula to determine which cells to format”. Go to Format, select yellow color under Fill, and press OK.
All Food & Travelling items are marked yellow. C2 is the cell from where all the entries of Categories are starting. Thus C2 is used to check both the conditions – food and travelling. 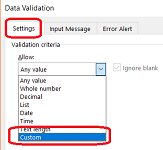 Automatically, C2 becomes C3, C4 and so on, when Excel starts checking each of the value in column C, credits to relative referencing feature of Excel. 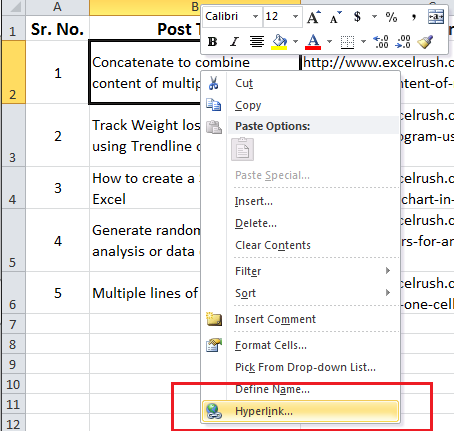 Since both conditions are under OR, when either of them is true, conditional formatting will be applied. the ” ” are required as food and travelling are text values. Whenever you go on a holiday, you fix a budget in mind before hand. Are you able to keep a good track of your spends? Are you able to know at any point of time, that you should let’s say spend less on shopping as your food bills are more than expected? Are you able to decide immediately whether to upgrade on a hotel room (and surprise your husband/wife! ), since you have spent less on internal travelling than expected? 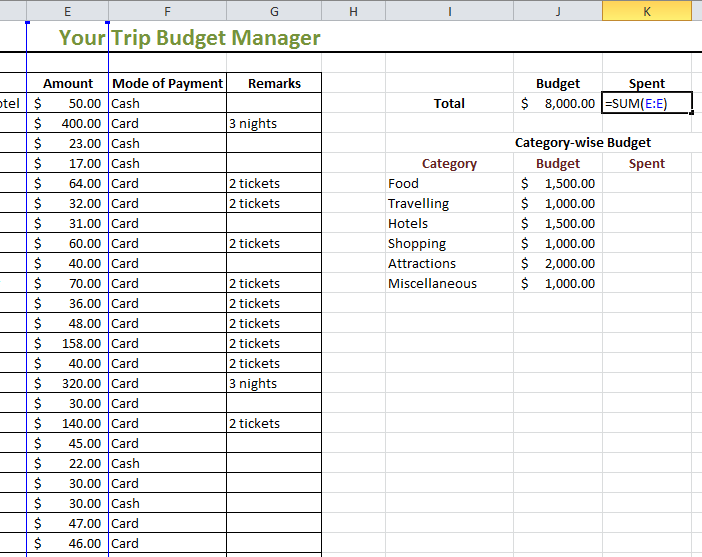 You can track your spending with this very simple Excel sheet to make quick decisions during your trip, and save money on the go! 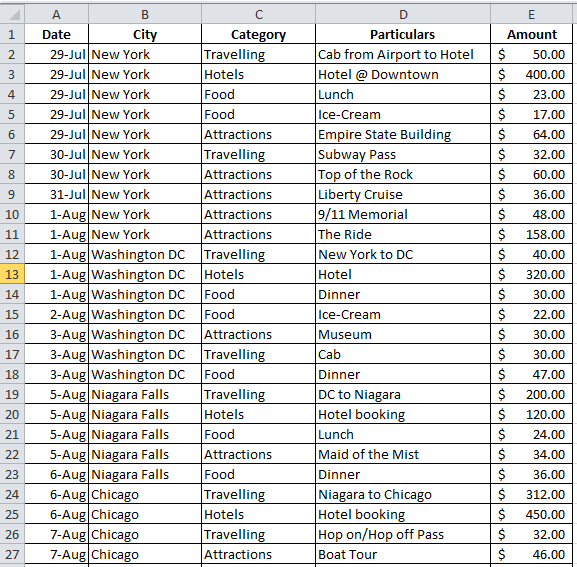 Below is a sample of spending on a USA trip. It is a 22-day trip covering the East Coast and the West Coast. You have so far covered – New York, Washington DC, Niagara Falls and Chicago in 12 days. From Chicago, you will be going to the West Coast. You have 10 more days to go, and you need to know what’s the current status of your Budget v/s Spending?!! Total budget for the trip is $8000. 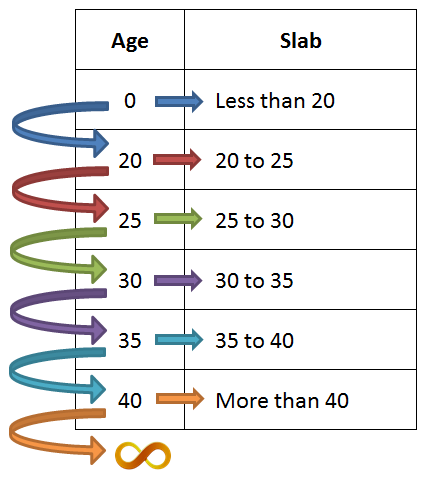 = SUMIF will be used to calculate for each category. For the other categories, simply copy the Food formula downwards. The I8 will change to I9, I10 and so on, giving the respective Amount for each category. The C:C and E:E will not change as rows are not mentioned. 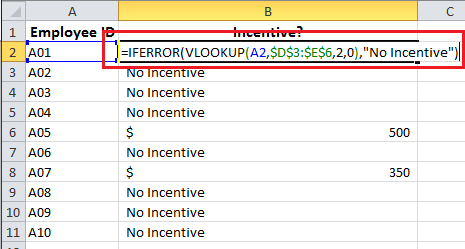 If rows are mentioned in your formula (like C4: C100), then you will need to use the $ sign to fix the rows (C$4:C$100). To learn how to use =SUMIF in-depth, click here. 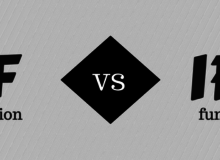 Thus, once you reach the West-coast and as soon as you make a new entry of spending in the sheet, the formulas give you a current scenario of Budget v/s Expenses. Do use this on your next trip!